Most bird watchers (Including me) have a few species on their “most-wanted” lists. Those elusive birds that we’ve been looking for, for years. We imagine the number of times we passed by them, hidden on the trail, unseen. One of my most wanted species was the Harpy Eagle. Living in Costa Rica for 12 years, I always thought I’d have a better chance, but the truth is that the population of Harpy Eagles in Costa Rica has steadily dwindled. They can be seen deep in the Osa Peninsula in the Southern Pacific area of the country, but it’s very difficult. I decided to up my chances and travel to the Darien Jungle of Panama, where I knew the population was stronger. With Rudy Zamora, our Naturalist Guide, and a group of fellow bird watchers we departed our home cities to meet in Panama City. Today was “gathering day” as our group flew into Panama City from all around the U.S. and from Costa Rica. Besides a lost suitcase (that showed up later that evening), arrivals went as planned. Everyone tried to get a few hours’ sleep, as we had a very early a.m. departure for the Darien Jungle. Harpy Eagle, here we come. 5:00 a.m. we depart Panama City, make a quick stop at a grocery store for some last-minute essentials (wine & vodka) and continue on the Pan American Highway to our destination, The Darien National Park. Of course, the bird watching begins immediately as we pass the mud flats in Balboa and look to the sky for raptors. We reach the small town of Akua Yala and Lake Bayano where we make a stop to stretch our legs and check the lake and surrounding area. It was a successful stop. Our trip continued to the town of Torti Medio, where we made a stop for lunch. The owner of the cute typical restaurant, being used to bird watchers traveling this route, had put up a nice array of hummingbird feeders. We were able to have a cold drink, and a good typical Panamanian lunch, watching the hummingbirds buzz through the feeders and flowering plants and bushes. 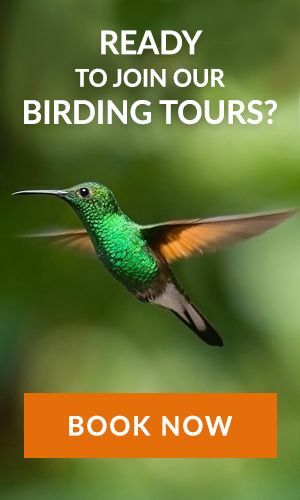 We had great looks at the black-breasted mango, the Scaly-Breasted, the snowy belly, and the violet belly hummingbirds. Hitting the road again, we continued through to the Canopy tent camp located outside the tiny town of Sanson. With stops, the drive was about 5 hours. It felt good to reach our home for the next 4 nights. Our greeting from David, the camp manager, was friendly and informative, as we were given the run down on how everything worked at the camp. We were assigned our tents and after a quick check on our accommodations, everyone was back to bird watching around the grounds of the camp. 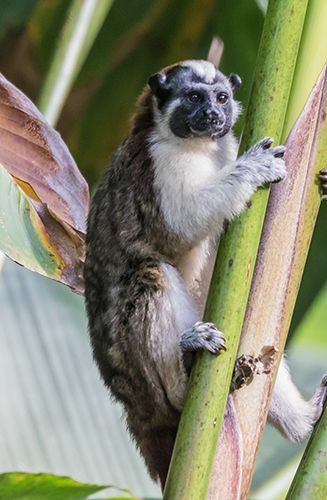 Our next greeting came from a troop of Geoffroy’s Tamarins. These adorable little monkeys seemed excited to see who was invading their jungle. They squeaked and peeped, jumped through the trees, checking us out for several minutes before disappearing into the treetops. Our next noisy visitors were the Oropendolas. A large tree beside the reception area housed around 100 individual nests. The Crested and the Chestnut-Headed Oropendolas gave everyone a fantastic show. The garden around the reception was full of tanagers, honeycreepers, hummingbirds, it was nice to relax in the rocking chairs and bird from the terrace. Today we depart the tent camp very early as we need to get into the jungle as soon as we can, to increase our chances of finding the Harpy Eagle. We take the Pan American Highway to the very end, the actual ending point of the highway, the town of Yaviza. From Yaviza we board our dug-out canoes and travel on the Chucunaque river, to the Tuira River to the small town of El Real. In El Real, we all climb into the backs of two pickup trucks, and continue to the town of Pejivasal, where we reach the entrance to the Darien National Park. With our team of Kuna Indian guides, we start the 5-mile hike into the Darien Jungle. 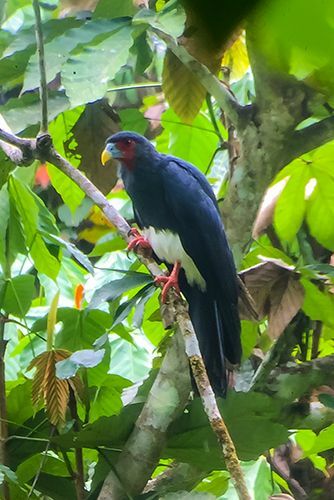 The jungle is alive with birds, but we keep a fast pace, hoping to reach the nesting site and catch a look at one of the world’s most amazing birds. The guides tell us that the site we are going to has been inhabited by a 2.5-year-old chick. Harpy’s tend to their young for up to 5 years, so finding a chick usually means Mama is in the area too, searching for food for her baby. We reach the nest to find it empty! The heat and humidity are oppressive, but the group agrees we have come this far we must wait. 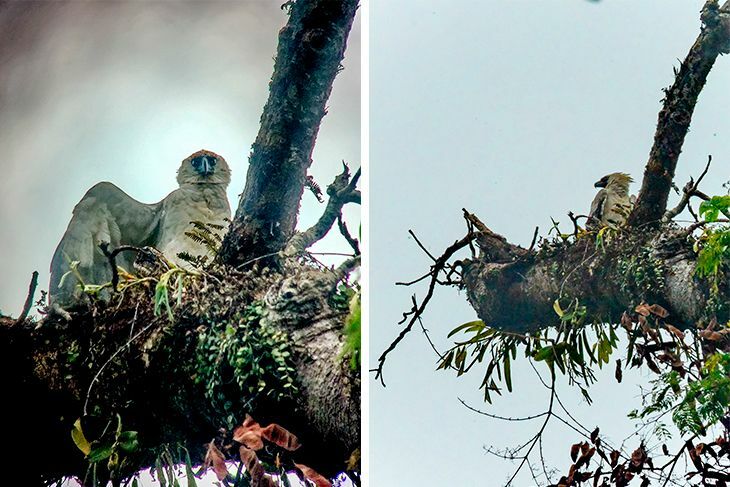 In the meantime, our trusty local Kuna guides set out to check other trees, and other sites in the area, with the hopes of helping fulfill our dreams of seeing the Harpy Eagle. A couple long, hot hours later, our guides excitedly return, and we grab our things and hustle down a winding trail that goes up and down, and up and down, ending in a small clearing in the forest. We have just enough room to squeeze in and there is our prize, a full view of our 2.5-year-old Harpy Eagle. It was a bit surreal, seeing something that was on my birding bucket list for so long. This majestic bird did not disappoint. We grabbed as many photos as we could, without disturbing this gorgeous creature, and set off back down the trail. Today we took to the Penitas Road through the small Embera Indian village called Nuevo Vigia. We did our due diligence and visited the village and then continued back to the lodge for lunch. The Penitas road was excellent yielding us the blue cotinga, spectacled parrotlet, mustached ant-wren, and the one-colored becard. After lunch, those of us who could withstand the heat went on our open-air truck to a dirt road called Lajas Blancas. This afternoon was incredible. We saw the common potoo, the 3 jacamars (dusky back, great, and rufous tail), russet winged schiffornis, the orange-crowned oriole, and the yellow-backed oriole. We will never forget the amazing sighting of the potoo by Eli from the truck. HOW DID HE SEE THAT? That evening we enjoyed our farewell dinner at the Tent Camp preparing for an early departure back to Panama City. Highlight Species: Blue Cotinga, Spectacled Parrotlet, 3 Jacamars. This morning we left very early to arrive at the San Francisco reserve for our last day of birding in the Darien region. We took a nice dirt road, starting our walk, and to our surprise encountered what was by far the best mammal of our trip. A mother jaguarundi with 2 cubs. We had an amazing look as they languished in the road, and then leaped into the forest. Wow! This area was rich for mammals as we also encountered a 3-toe slot and a tamandua. Update: After a successful “Hunt for The Harpy Tour” this year, we are organizing another trip for March 2019. Join us for this trip. Get a quote now!